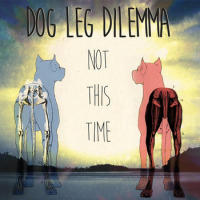 Not This Time is the energetic and eclectic new album from Canadian quartet Dog Leg Dilemma. Featuring 7 original tracks, Not This Time is a sonic adventure that bears repeat listening! Led by bassist Peter Bull, Dog Leg Dilemma began as an experiment, playing Bull’s compositions and adaptations from various different ensembles. The band has flourished since it’s inception and has captured audiences with their creative, and lively performances. The music is influenced by his admiration for the works of Frank Zappa, Charles Mingus, Bernard Herrmann and Canada’s own Chris Tarry. Not This Time is Dog Leg Dilemma's first official foray into the world of recorded music. It is a meticulously planned sonic experience, designed to ow smoothly from beginning to end as one continual experience. Unlike many freshman albums, Not This Time takes full advantage of the possibilities of the studio, featuring additional string performances, ambient soundscapes, and much more. Not This Time will be released worldwide on Friday, January 6th, 2017.